As winter settles in on the Greater Yellowstone Region, the snowbirds fly south either by wing or by motor coach. Those of us that are more grounded either by work, will, finance, perverse adrenalin addictions or a slavish dedication to the four seasons settle in and prepare for the curses and blessings of winter. 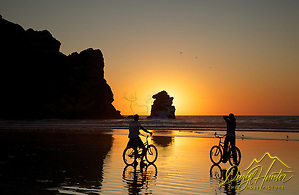 Bicyclers, Beach, sunset, Morro Rock, Morro Bay, California. You can find a scene like this year around in San Luis Obispo County where I grew up. I grew up in San Luis Obispo California, where the weather hardly changes. In spring it greens up, in summer it turns brown again until February but the temperature rarely dips below 60 degrees and if the water in the garden hose freezes it is a talking point between neighbors. In summer, the thermometer rarely breaks 85 degrees. For many it is the perfect place. When I was a teenager, I found out San Luis Obispo County was a tourist destination, and nothing could have surprised me more. How could that be, this place is so ordinary? I know, I had all the wisdom of a teenager! As a young adult I moved around a lot, all over California and Alaska, no moss grew under my feet as I lived as the metaphorical rolling stone. I sampled many places before the Greater Yellowstone captured me and wouldn’t let me go. I later concluded my wanderlust was satiated by the change of seasons and my wandering must have been an escape from the drudgery endlessly perfect weather. Me and my dogteam in the Alaskan Wilderness of the Talkeetna Mountains at Hatcher Pass, north of Willow. 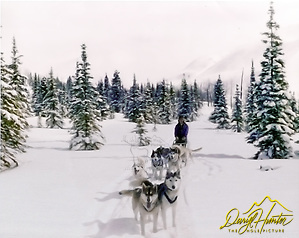 Living in Alaska as a dog musher I decided I liked winter better than summer, which was when my sport of choice occurred, besides there was no mud nor mosquitoes during winter. My preference for winter continued when in my thirties when I moved to Jackson Hole, in the Greater Yellowstone, a skiing nirvana. As I remained in the Greater Yellowstone season after season year after year, I learned I loved to see each season come, and I love to see each season go. As a photographer I marveled how the landscape changes every several months and brings a new variety of subjects to my lens. Every season has its primary focus. Springtime is for grizzly bears as this is the time when it is easier to find them. It is also time to photograph the landscape coming back to life from its long winter slumber. Summer is alive with leafy greenery, summer thunderstorms that bring drama to our landscape, and baby animals fill us with the awe of cute. Fall brings the drama of the breeding season of the mega fauna, elk, deer, moose etc, magnificent creatures fighting for the right to perpetuate their species. 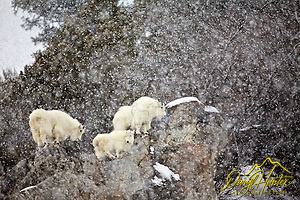 In winter many mountain top dwellers come down to the valleys for the winter so we can get a look at them. Deep snow drives the bighorn sheep, elk, mountain goats etc. to the lower elevations where it is easier to paw their way through the snow for a bite to eat. Winter also brings that beautiful blanket of snow. At the beginning of my first winter in Alaska I looked out at the snow covered landscape in a spot where it was valley and no mountains, As I looked I wondered, here we have the dull green of the trees, the white of the snow and the blue of the sky, why is this so pretty. My conclusion; despite the paucity of color or towering mountains the snow-covered landscape smoothed out all the rough edges and softened the look of everything bringing a pleasing ambiance that was different than the one before. I’m older now and my snow shovel is heavier than it used to be. My driveway seems to have grown as exponentially long as my property tax bill large. Unfortunately, a snow blower costs about the same as a new lens and my propensity to never make my life easier, I always buy the lens or some such thing instead of the snow blower. Skiing has less appeal as my agility leaves me short of what I once could do. After moving away from my hometown I learned of its appeal as it is a stunning place, but sometimes you have to back away from something before you can see it. I no longer prefer winter to summer, and I do play with the idea of a winter escape to southern Utah or northern Arizona. But, since I have neither wings nor a motor coach I will remain here with the less mobile and hole up like the grizzly bear except with frequent forays to capture the beauty that remains constant unlike the ambulatory mentality of man. Posted on Monday, October 29th, 2012 at 10:59 am. Filed under: My Muse Tags: "let it snow", American Southwest, Daryl L. Hunter, going south, Greater Yellowstone, photography, snow birds, Snow country, winter	RSS 2.0 feed.